"Paris is the most beautiful city in the world, n'est–ce pas? ", announced the driver of bus number 62 as he eased to a stop behind the rush hour traffic on Pont Mirabeau. Pointing towards the Eiffel Tower in the distance, he let out a long sigh that was clearly audible over the public announcement system. Like a group of jet-lagged tourists visiting Paris for the first time, all of the passengers automatically swiveled their heads in unison to admire the sweeping view of their city. It is stunning. I can't fault Parisians for being so proud. And thanks to Mayor Delanoë's plan to "reclaim one of the most beautiful urban and river landscapes in the world", the cityscape is about to become even more remarkable. Central Island will be the main entry point for the archipelago. 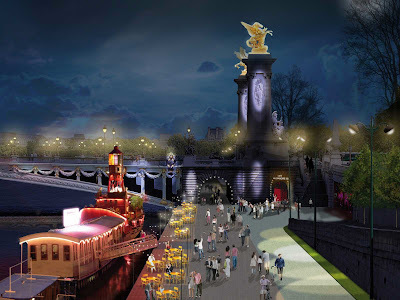 It will include a large open space for people to relax while watching the river traffic. Meadow Island will be generously planted with grass. There will be a net suspended over the center of the meadow that will be large enough to accommodate 140 people. Bird Island will be the most densely planted islet with a large open bird cage. Orchard Island will feature an apple orchard and a wooden deck. Mist Island, the most mysterious of the islets, will be equipped with aqua misters that operate in sequence to produce fog. As the easternmost islet of the archipelago, Mist Island will have a splendid view of Pont des Invalides and the Grand Palais. 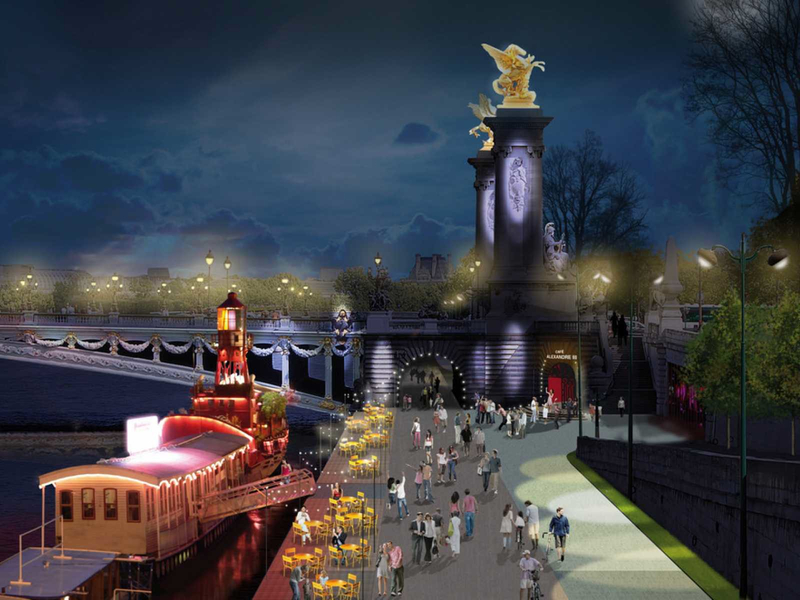 In addition to the archipelago, a restaurant and a space dedicated to cultural performances will be created under the Pont Alexandre III. With the conclusion of the redevelopment project scheduled for the summer of 2013, anticipation is running high. Visiting the construction sight was the one thing that Stéphane wanted to do during his day off yesterday. 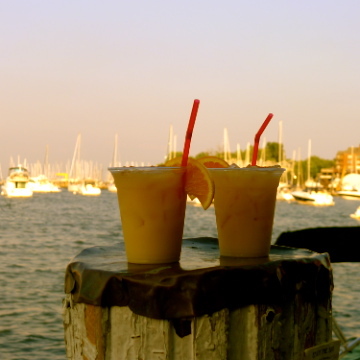 We'll keep tracking the progress of the islands and let you know as soon as they're finished. Fantastique! Thanks soo much for this tip! I will definitely go and check it out.. I live in the south burbs.. Antony... and I have not really gone up to Paris all winter/most of spring so far.. because of the cold, but I can't wait til it gets more springy and I'll have new things to check out! Here's hoping that the weather improves soon so that you feel like venturing into Paris. It has been so grey and miserable for most of the winter/spring that I completely understand the desire to stay at home in the burbs. It seems as if they're making good progress on the islands/gardens so I really hope that it's finished by the time that your guests arrive. I knew about the transformation further along but hadn't heard about the archipelago. Thank you for a most informative post! 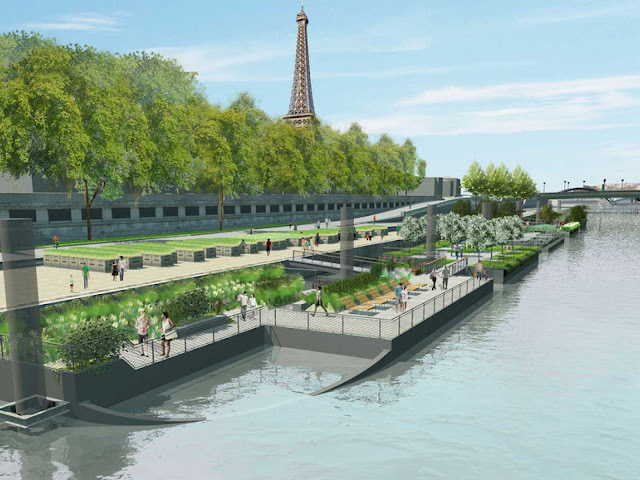 Since I don't drive in Paris, I'm really happy with this initiative to make the riverbanks more pedestrian/bike friendly. It was interesting to follow the progress of the islands because they were specially constructed in Le Havre. There are some videos on the Paris.fr website. What a great idea! More public spaces and plantings can never be a bad thing. Thanks once more for your insights into Paris Mary Kay!! I have to admit that I don't know very much about local politics in Paris but I appreciate many of Mayor Delanoë's initiatives, like the summertime beaches along the Seine, Velibs and the creation of public places. He's not running for re-election in 2014 so all of these projects will be part of his legacy. Ok...back from Paris only 5 days and already my next trip "list" has begun !! I just hope that you'll stay longer the next time that you come to Paris! Your visits are always way too short. Most definitely! I can't wait to climb on the suspended net on Meadow Island and read a book on the central island. Great post Mary Kay. I'm on the side of yet to be convinced by this. When I first saw the video about the islands being made, and then I saw the ugly poles sticking out of the Seine, I was so disappointed. To me, the Seine is so beautiful as it is, and it is already possibly to walk along and enjoy it. A floating garden at enormous cost for the limited number of people that will be able to them at a given time, just seems wrong to me. Not to mention there are already so many beautiful spaces around Paris, perhaps the 'keep off the grass' signs just need to be removed so that Parisians can enjoy them. I'll certainly be watching and waiting to see the finished product. Very exciting to see the work in progress, we will have to return to see the result.